In Oregon, a police officer was on regular patrol when he observed a collision which caused the death of a young boy. The collision happened at 4:16 PM and the police officer responded immediately to render aid and try to resuscitate the young boy. The incident happened at an intersection which KOIN6 reported has been described as “treacherous.” There is a MAX train going east and west in the intersection, there is vehicle traffic at the intersection, and there is pedestrian traffic as well as children playing on the corner. Unfortunately, many pedestrians die in Oregon each year, not only at this intersection but on roads throughout the state. National Highway Traffic Safety Administration reported pedestrians accounted for 48 of the 313 people killed statewide in car accidents over the course of 2013. This was 15.3 percent of fatalities statewide. Pedestrians and drivers can all come together to try to bring down death rates so tragic collisions like this recent deadly crash can be avoided. 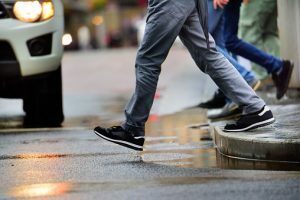 NHTSA explains when and where pedestrian crashes are most likely to occur, and motorists and walkers can learn about these dangerous locations so they can make sure they are careful in high risk situations. For example, NHTSA indicates 69 percent of crashes happen outside of intersections, compared with 20 percent at intersections and around 10 percent at other spots like on trails. Pedestrians must be cautious regarding walking on roads when outside of designated crosswalks. They should avoid stepping out in between cars, should cross at intersections whenever possible, and should try to avoid walking on road shoulders or other roads without sidewalks. Drivers can also try to avoid striking walkers at non-intersections by avoiding high-risk behaviors like speeding and driving while distracted. It is a good idea for drivers to slow down when in residential neighborhoods, school zones, or other spots where there tend to be high concentrations of children. As summer comes and more children are outside, this will become increasingly important. NTSA also indicated 72 percent of pedestrians who are killed are involved in accidents at night, while just 25 percent experience fatal collisions in daylight. Two percent of deadly pedestrian crashes occur at dusk and another two percent of daily pedestrian collisions occur at dawn. Drivers have to be more careful to look for pedestrians when it has begun to get dark. Pedestrians can also take steps to protect themselves from these night collisions, like wearing reflective clothing so it is easier for drivers to see them after dark.